Neale Conservatories offer FREE no obligation quotes for residents throughout North Wales & Chester. 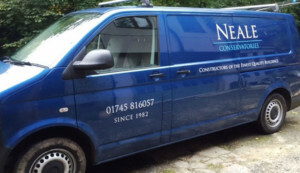 Neale Conservatories was first established in 1982 by Philip Neale. Our service backs up a fantastic range of products, all fully guaranteed and energy certified, made to the highest standard. We offer a complete peace of mind that you are dealing with a company that has your interests at heart.